You’ve got to hand it to producer Jason Blum, regardless of what quality his movies are, he’s a great businessman. Instead of spending tens of millions on a movie that could not do very well at the box office, he and his production company Blumhouse Productions spread that money over a large number of projects, barely any of them exceeding a $10 million budget, and produce them independently before releasing them on a wide platform, with many turning in a profit within one or two weeks. Through their system, they have helped nurture several new horror franchises like Paranormal Activity, Insidious and The Purge, as well as given life to several critical and financial successes (as well as one or two awards contenders) like Get Out, The Gift, Split, Whiplash and Oculus. With that in mind, the nicest thing I can say about Truth or Dare, the latest low-budget horror from their wheelhouse, which ranks amongst neither of those other films, and more so with some of Blumhouse’s lesser outings like The Gallows, the first Ouija film and Jem and the Holograms, is that it will probably at the very least turn in a small profit for the studio. Other than that, this cheap, ridiculous and wildly unscary annoyance of a supernatural slasher movie isn’t a game that’s worth playing. It’s about a group of college students who go to Mexico to spend their last spring break together, where they come across a stranger named Carter (Landon Liboiron) who takes them to an abandoned church and gets them to play a simple game of – what else? – Truth or Dare. Once they’re deep into the game, Carter tells them that their lives are now in the hands of a demon who has taken control of the game, and is forcing players to pick either a revealing truth to blurt out, or a dangerous dare to then enact; failure or refusal to do so will result in a gruesome death for the chosen participant. Now, the college students have little choice but to play along or face the dire and often fatal consequences. You may have noticed that whilst describing the plot, I didn’t really mention anything about the actual characters we’re meant to be following; that’s because they are all so generic and unengaging that they all just kind of blend together with barely any defining features. There’s only a handful of identifiable personality traits, like the goody-two-shoes who’s played by Pretty Little Liars’ Lucy Hale, the one who’s gay, one of them’s a functioning alcoholic, and those are really the only ones that stick out to me. Other than that, these are a bunch of generic teen slasher movie characters that you really have no connection to, nor do you care about any of them when bad stuff happens to them, despite the acting being for the most part passable (with the exception of the one guy who always looks like he’s slightly smirking even in situations that are not worthy of a smile). Speaking of smiling, the demon has the power to possess people whenever it is convenient in this movie, and the way you can tell that a person is possessed is that said person has a great big permanent CGI grin all over their face, and frankly it looks bloody ridiculous every single time. In addition to the fact that the effects used on these peoples’ faces look absolutely atrocious, even for the small budget this movie carried, but they look so silly and almost like out of a stupid comedy instead of a straightforward horror like this is meant to be. At no point are you scared by these faces, or anything else in this movie as a matter of fact, but instead holding back laughter because it looks unintentionally hilarious and like a really bad Photoshop project that somehow made its way into cinemas – a character even refers to it as a really bad Snapchat filter, which is frankly too nice a comparison for how awful it looks. The nothing characters and incredibly stupid-looking effects are one thing, but on the whole this movie just isn’t scary in the slightest, not even enough to pass as a 12A certificate let alone a 15. It’s got all the stock jump-scares and horror movie clichés you could think of – characters even visit an elderly Latino figure for advice on the supernatural being, a trope I thought had long since passed since the Paranormal Activity movies but is apparently live and well as evidenced by this movie – which you’ve seen before at some point in a horror movie, so none of it is original or fresh, and you can just feel the desperation of the filmmakers in trying to make you jump or scream out loud at just about anything, even if it’s the most lame and predictable fright they can conjure up from their unimaginative minds. You’re largely just bored while watching it, because it’s not entertaining you with good scares, and it lacks any real characters that you can care about, especially as they make dumber and dumber decisions throughout the movie, even with the knowledge that a weird supernatural being with a goofy grin is behind all of this. The ending is especially dumb, as it just seems to make everything worse than it already was, and you can’t stop thinking about how much this was a potentially apocalyptic idea for everyone even as you leave the auditorium, confused and largely underwhelmed. Blumhouse, for the most part, has used its powers for good over the last few years, but films like Truth or Dare are reminders that even the studios with the smartest financing strategies can still churn out a turd every once in a while. 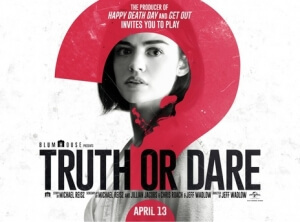 Truth or Dare is a fright-free and increasingly ridiculous horror movie, with characters you don’t care for, awful effects that make things more funny than actually scary, and stock clichés that make this a throwaway movie in the worst sense.